There are romantic comedies, and then there’s Annie Hall. It’s about a romance, and it’s definitely a comedy, but Woody Allen’s masterpiece works so far outside the genre that it feels like something entirely different. Allen and co-writer Marshall Brickman use character, not plot-driven contrivances, to bring these two together and pull them apart. These two lovebirds are only compatible for the short term. Indeed, it’s hard to imagine that anyone could be with Alvy for the long haul. He’s judgmental, obsessed with death, and utterly self-centered. When Annie misses a psychiatrist appointment, he takes it personally. Not that Annie is the perfect girlfriend. She’s flighty and inconsistent. Her libido slows down early on. She breaks up with him, then calls him at three in the morning because there’s a spider in her bathroom. And she’s attracted to a Los Angeles culture that the New York-bred Alvy finds shallow and vapid. The movie covers more than this romance. We have flashbacks to Alvy’s childhood, and to both Alvy and Annie with previous lovers. This was Allen’s first film with any pretensions of realism, but he wasn’t ready to renounce his earlier klutz persona. He breaks up the verbal humor with a few scenes of physical comedy that bring in additional laughs–especially the cocaine scene. Annie Hall isn’t just realistic, character-driven, and very funny. It’s also surreal. Alvy occasionally breaks the fourth wall and talks to the audience. In a flashback to his childhood, the children he went to school with stand up and tell the camera what they’re doing as adults. In a split-screen shot comparing Annie’s and Alvy’s families, the two mothers talk with each other. There’s even an animated sequence. I saw Annie Hall many times before I realized that the entire picture takes place in Alvy’s head, as he tries to figure out what went wrong in this relationship. This construct justifies the flights of fancy in this otherwise realistic film. 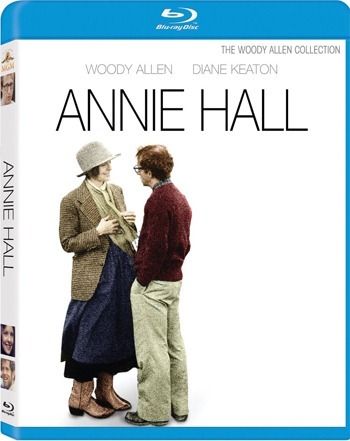 If you’re grieving a newly-dead relationship, Annie Hall helps the healing process. But it’s also a great romantic movie; 13 years ago I watched it with a new girlfriend on Valentine’s Day. She’s now my wife and we watched it again this week. In fact, I’d be hard-pressed to think of a time when it isn’t appropriate to watch Annie Hall. Fox’s 1080p transfer does the film, and Gordon Willis’ cinematography, reasonable justice. The image is clear, and capture the shadows that gave this comedy such an unusual look. (There are reasons that Willis was nicknamed “The Prince of Darkness.) I saw details here that I hadn’t seen in decades, even when I’d looked for them. For instance, I could finally see that Alvy’s date in one shot, a woman so far from the camera she was more an extra than an actor, really was a not-yet-famous Sigourney Weaver. But the images weren’t as sharp as I’d expect from a 1977-era color film, and the contrast ratio occasionally seemed flattened. Perhaps the original elements weren’t in good condition. Since Fox makes nothing of it in the promotional materials, I can assume that neither Allen nor Willis oversaw or approved this transfer. It’s leagues better than the DVD, of course, but that’s hardly surprising. The only DVD release was early and not even anamorphic. The movie begins with the MGM logo, despite Annie Hall not being an MGM film. That’s followed by the UA logo used when the film originally opened. Like most movies of its time, Annie Hall was released with only a mono soundtrack. Even today, all of Woody Allen’s films are released only in mono. So Fox and MGM wisely decided to keep it that way. They present that mono track in the lossless DTS-HD Master Audio format. That way, no sound quality is lost to compression. The result is crisp and clean. No complaints about dialog, sound effects, or music. This is probably the best it has sounded since Woody Allen approved the final mix. Woody Allen approves of DVD supplements about as much as he approves of surround sound–as something totally inappropriate for a movie. The only extra on this disc is the original trailer. Which is a pity, because Annie Hall’s creation is a fascinating story. It wasn’t intended to be a movie about a relationship, and the final form was discovered in the editing room. Your best source for that story is Ralph Rosenblum’s memoir, When The Shooting Stops … The Cutting Begins: A Film Editor’s Story. Annie Hall isn’t the film Woody Allen set out to create, but merely the one he stumbled upon. Yet it belongs on every list of great comedies, and arguably any list of great films.